Beets are one of the most nutritious vegetables you can eat. They are a good source of iron, the B-vitamin folate, vitamin C and the mineral manganese plus a variety of other vitamins and minerals. A major contribution beets make to our health is in providing amply amounts of nitrate. The body uses nitrate to produce nitric oxide. Nitric oxide provides circulatory and respiratory benefits for the body by relaxing smooth muscles and dilating blood vessels allowing for better blood flow. Because nitric oxide dilates blood vessels, it can help to reduce high blood pressure. A number of studies have shown consumption of beet juice lowers blood pressure. By providing both iron and nitrate, beets contribute to better blood circulation and oxygen utilization. Oxygen is essential to sustained performance. During intense physical exertion, we become oxygen deprived which leads to a build up of lactic acid in the muscle tissue. Lactic acid buildup leads to muscle fatigue as witnessed by that burning sensation you feel in your muscles with intense exercise. Iron is essential for the manufacture of oxygen carrying red blood cells and nitric oxide can reduce muscle fatigue by supplying more oxygen to the tissues. Nitric oxide also appears to help with glucose metabolism. The American Journal of Endocrinology and Metabolism published a study that tested a group of endurance cyclists and found that nitric oxide helped them assimilate glucose at an increased rate, especially during workouts of an extended duration. When young, our bodies produce ample amounts of nitric oxide from the amino acid L arginine, oxygen, a reducing agent called NADPH and various enzymes. As we age, our bodies become less efficient at producing nitric oxide in this manner. By the time we reach forty, studies show we only make about half or less of what we made when in our twenties. As we grow older, we need more vegetable nitrate which the body uses to produce nitric oxide. You can measure your nitric oxide levels using nitric oxide test strips on your saliva. Test strips are available from Berkeley Test through Amazon.com. You may have concerns about nitrates/nitrites and their connection to cancer causing nitrosamines. When nitrates and nitrites are exposed to high heat in the presence of proteins, they can form compounds called nitrosamines. Nitrosamines have been shown to be carcinogenic. Nitrates are often added to processed meats such as hotdogs and bacon as preservatives and color stabilizers. When these meats are heated to high temperatures, nitrosamines are formed. Nitrates and nitrates from vegetables do not generally produce nitrosamines as such foods are rarely exposed to high heat nor do they have the protein levels of animal products. We encourage you to make beets a part of your diet. If you have a garden, they are easy to grow. They make a great cooked vegetable. You can also use the beet tops in salads or as a cooked vegetable. Canned beets are available at your supermarket but because of processing are not as nutritious. The better choice is to purchase fresh beets from the produce section of your grocer. Drinking beet juice is an excellent way to obtain the benefits of beets. At Milk ‘N Honey we carry a concentrated beet product called RediBeets. RediBeets is dehydrated beet root juice in a powder form that can be added to water to provide instant beet juice. 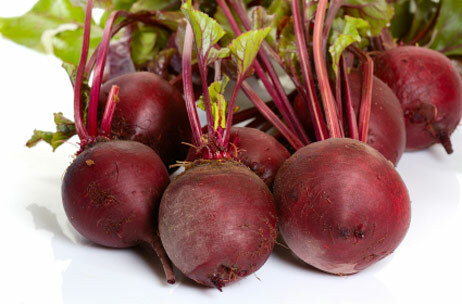 It takes approximately 20 pounds of beets to make one pound of RediBeets powder. We also carry an even more concentrated beet product called Red Rush. This product comes as a liquid and provides 500 mg of nitrate in one serving. Ready to drink bottled beet juice is also available at our store.